When I attended Samford University, the parking situation was a nightmare. There simply weren’t enough spaces to accommodate commuting students, who were forced to drive around endlessly searching for a spot. I lived on campus until graduation in part because I didn’t want to fool with it. My younger brother, Kent, began attending Samford the year after I graduated. He commuted his junior year and quickly grew frustrated with the parking hassle. Our father, meanwhile, occasionally taught classes as an adjunct professor and never had difficulty finding parking. Kent was mindful of that fact when he noticed a Samford faculty pass hanging from Dad’s rear-view mirror and decided, since Dad wasn’t teaching that semester, to steal the pass for his own use. From that point forward Kent had free reign to park his ‘93 Honda Civic in any of the coveted, steps-from-the-door, faculty parking spots. He thought he’d beaten the system until he realized there were parking rules — even for faculty — and he started racking up tickets. Or rather, my dad started racking up tickets. Quite a few tickets. In Kent’s defense (and he doesn’t have much of one), he did attempt to re-purpose the tickets. When he’d park in an off-limits space, he would retrieve his most recent ticket from the glove box and position it on the windshield to divert campus security. It didn’t always work. I remember Dad opening his check from Samford and raging about the parking tickets listed on his pay stub. Tickets he never saw on his car! Fines taken out of his paycheck! My brother kept quiet, secretly pleased with their little arrangement. 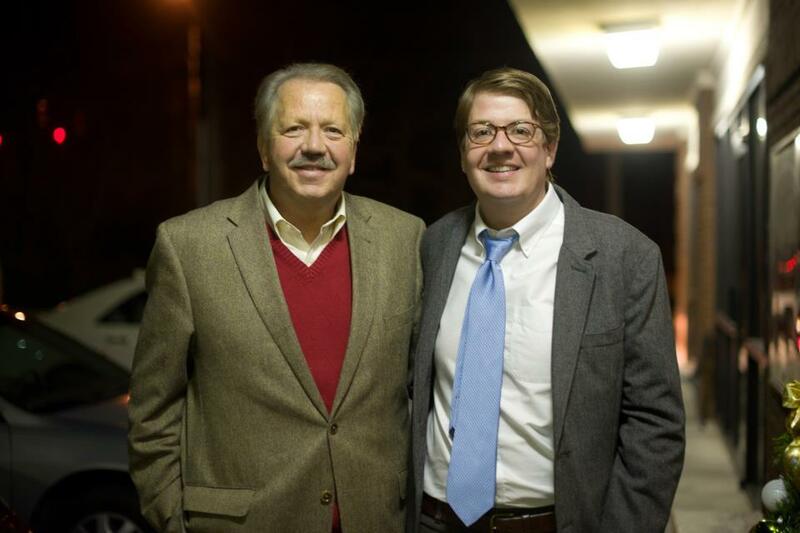 Ten years later, Kent now finds himself back at Samford as an adjunct faculty member. He called me last week, and with a chuckle, shared that he’s finally the rightful owner of a faculty parking pass. Parking pass buddies: my dad, Dr. Larry Michael, and the soon-to-be Dr. Kent Michael. Not pictured, my youngest brother, the soon-to-be Dr. Graham Michael. Let the record show that only one of those three eggheads can beat me in Scrabble. I think about Kent whenever I make fruit pies or pastries. When we were younger, he was the only person I knew who made pies from scratch — or really, anything from scratch. As someone whose idea of making a homemade treat was dumping a bag of M&Ms into a bowl of marshmallow fluff, I found this curious. Kent would have girlfriends over and they’d spend their “date night” making pie. I can remember passing them in the kitchen, raising an eyebrow and making my way as quickly as possible to my bedroom. Sadly, I never took the time to engage with them because 1) I was a self-absorbed college student who thought I had more important things to do like smoke cigarettes out my window read Ayn Rand and 2) I didn’t like fruit pies in any form. On occasion I might break off a few pieces of buttery, crinkled crust when no one was looking. Or if a piece of pie was forcefully set down in front of me I’d scrape out the filling and eat the pastry. But I simply wasn’t a fan, and it would take years before I’d come around. Today, I join the ranks of home cooks who find immeasurable joy in pulling a hot, bubbling fruit pie out of the oven and sitting down to savor a slice of summer’s iconic dessert, preferably with a scoop of vanilla ice cream. I’m slipping this recipe in at the end of August because I declare that no one’s summer is complete without a homemade hand pie. My children aren’t fans of fruit-centric desserts, but they devoured these pastries, which are heavy on flaky, buttery pie dough and light on filling – although not so light you feel you’re missing out. 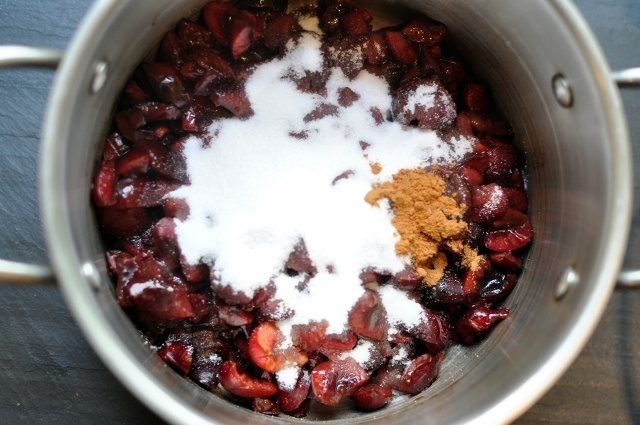 The cherries are cooked down with cinnamon and vanilla until thick and syrupy. In the center of each hand pie, a dollop of sweetened, lemony cream cheese mingles with the cherry compote; when cooked, each warm pastry boasts a tart, creamy center. 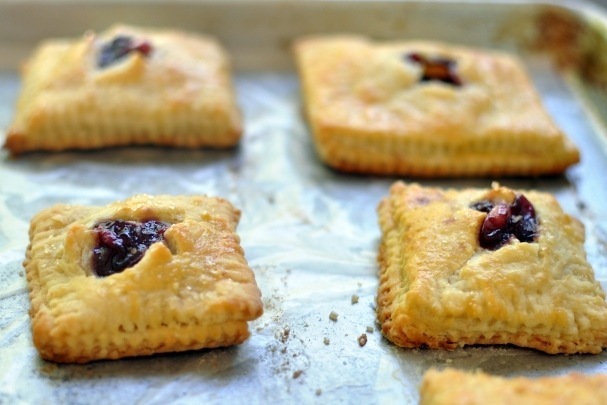 These hand pies are a labor of love but worth the time and effort, especially with summer fruit making its soon departure from our farmers’ markets and grocery stores. 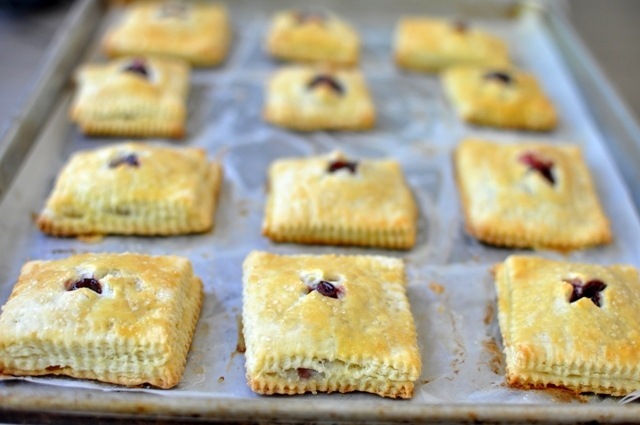 Because these hand pies involve multiple steps, make it easy on yourself and prepare the dough the day before you assemble and bake the pies. * Make your own buttermilk by adding 1 tablespoon lemon juice or vinegar to a scant 1 cup of milk. Stir and let sit at room temperature for 10 minutes before using. It should look thick and slightly curdled. Make The Crust: In a large bowl, whisk together the flour, lemon zest, sugar and salt. Using a pastry blender, a fork or your fingertips, blend the butter into the flour until the biggest pieces of butter are the size of small peas. Stir in ¾ cup buttermilk, mixing with a spoon or spatula until the dough starts to come together. With your hands, knead the dough several times to form a ball. If the mixture is too dry, add up to ¼ cup of buttermilk, one tablespoon at a time until the dough comes together. Form into a ball. Divide the dough in half and flatten each half into a disc. Wrap each disc in plastic wrap and store in the fridge for at least one hour up to two days until ready to use. The dough can also be frozen in freezer bags for up to one month; to defrost, place in fridge for 24 hours. 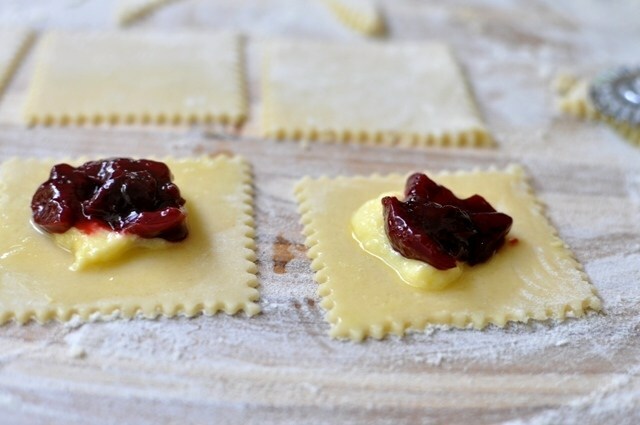 Make The Cherry Filling: In a small bowl, whisk together the lemon juice, corn starch and vanilla until smooth and set aside. 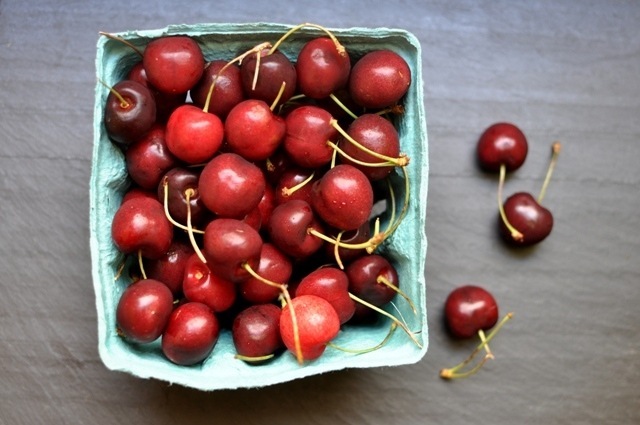 In a medium sauce pan, combine the cherries, sugar, cinnamon and lemon zest and cook over medium heat until the cherries start to release their juices. 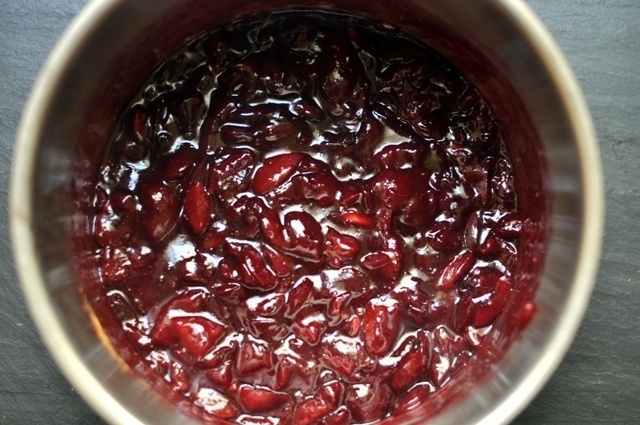 Stir the corn starch mixture into the cherries until well combined. Bring the mixture to a boil then reduce to a simmer, stirring frequently until the mixture thickens, approximately 6-8 minutes. Make The Cream Cheese Filling: In a small bowl, whisk the cream cheese, sugar, zest (if using), lemon juice and egg yolk together until smooth. Keep refrigerated until ready to use. Lightly brush half of the squares (the bases) with the egg wash. Cut a small vent in the center of the remaining squares (the tops). 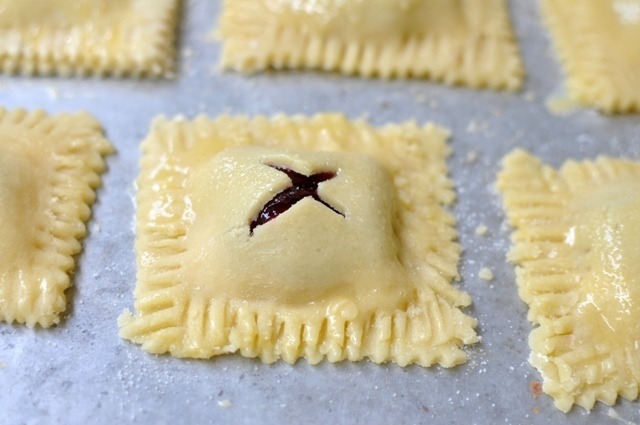 Add 1 ½ teaspoons of the cream cheese mixture and 1 ½ teaspoons of cherry filling the center of each square. Carefully position a vented square (lid) on top of the mixture, pressing the edges of the dough base and lid together lightly with your fingertips to seal the dough. Prick the edges gently with a fork to further seal the pastries. 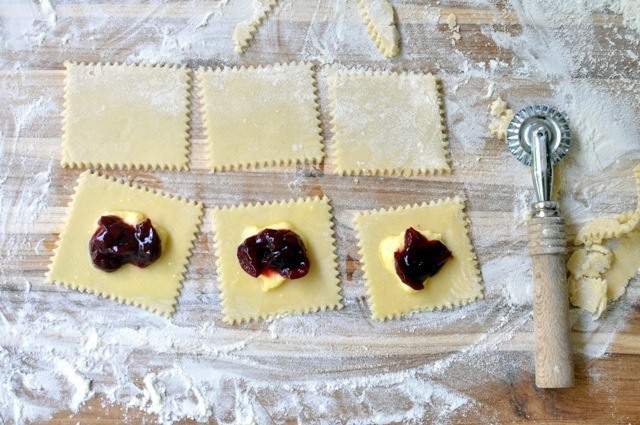 Transfer each square to a baking sheet. Repeat with remaining squares. When the squares are assembled, brush the tops with egg wash and sprinkle generously with course sugar. As you will have to cook the hand pies in batches, you may wish to keep the uncooked hand pies in the fridge until ready to bake. Bake the squares for 15-20 minutes until puffed and golden. Cool to room temperature before serving.